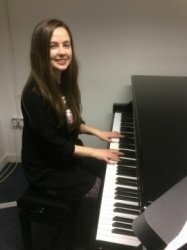 I am a qualified and experienced piano teacher hailing from Limerick, Ireland, where I studied Music, Media and Performance Technology at University. I have toured with the Co. Tipperary Ryan Youth Orchestra for the last four years, including performances at the National Concert Hall in Dublin, Ireland and the Lake Garda Music Festival in Italy. I perform in an expansive range of techniques stems from a wide variety of styles, from classical and traditional to pop and rock. I have been teaching for 5 years now and currently work as a peripatetic piano teacher at a primary school in Barnes. I am proficient in transcribing music to Sibelius, I have excellent sight reading skills in the treble and bass clef as well as having good knowledge of the alto and tenor clefs. I have been learning piano since the age of ten and since then have completed all graded exams including receiving an high achievers award during this time. I have studied Music Media and Performance Technology at University for four years. Being apart of the Orchestra has allowed me to travel and perform in some amazing venues such as Italy and the national concert hall in Dublin. It also made me expand my skills as a pianist and since joining my skills have advanced. I have studied both Keyboard and Piano up to Exam level 8 with the Royal Irish Academy of Music, the Irish equivalent of ABRSM. I am also qualified to teach Rock school graded exams as well as teaching beginners the basics following John Thomson's Piano for beginner books. These are an excellent way to begin a journey in learning more about music and a great start if you want to pursue grades as well as just learn music for fun. I am qualified to teach both theory and practical aspects of the course which will help students to gain a better understanding of both piano and music. Over the years I have taught kids and adults of all ages a wide variety of styles, from classical and traditional to pop and rock. Students will have the opportunity to develop and learn at their own pace as well as completing grade exams. As a teacher I find it best to adapt lessons to students age ability and to what they would most like to get out of each lesson. Once this is established I can design a lesson plan to achieve progression in the right direction. At the end of each lesson the student will be given homework to complete and practise for next weeks lesson in order for them to excel to best of their ability.